"Joseph, Family and Dreams" is the sermon given by Rev. 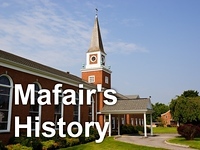 Kim Goddard at Mafair UMC on July 15, 2012. Musical selections are taken from Joseph and the Amazing Technicolor Dreamcoat, by Andrew Lloyd Webber and Tim Rice.